Collaborate 10 Technology and Applications Forum for the Oracle Community was held in April 18-22, 2010 in Mandalay Bay Convention Center of Las Vegas. 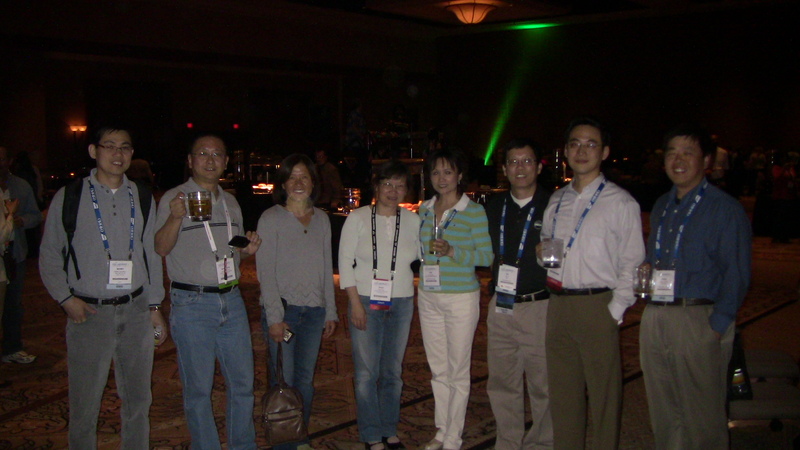 My experiences at the conference started with the IOUG reception on Sunday April 18 where I was supposed to maintain the IOUG RAC SIG table. 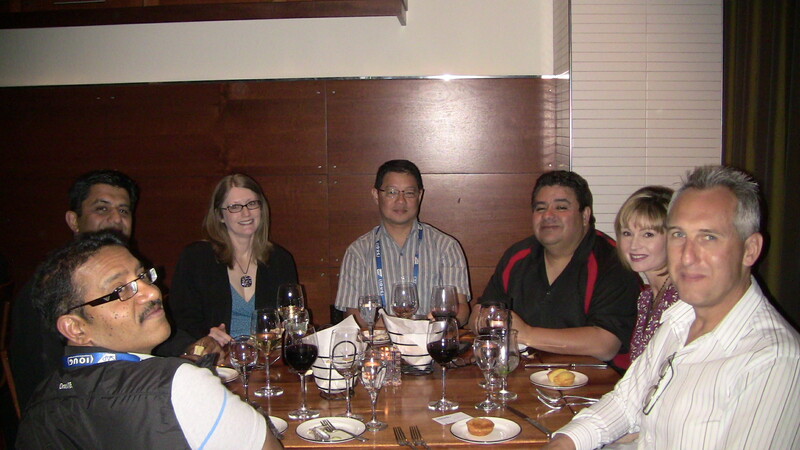 After the IOUG reception, Oracle ACE program senior manager Victoria Lira hosted Oracle ACE dinner in Sunday evening, where for the first time I met the fellow Oracle ACEs from around the world. 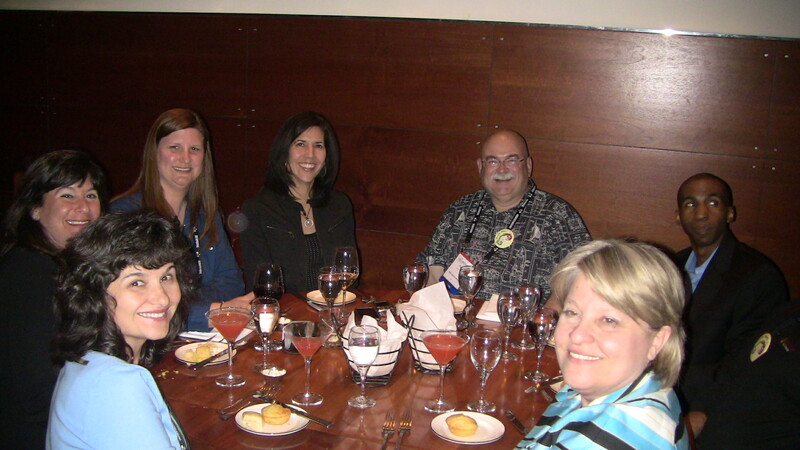 See the photos from my other post “Meet Oracle ACEs at Collaborate 10”. The official conference started on Monday April 19. My efforts focused on hosting RAC SIG birds of feather panel and my conference presentation “Building Oracle Grid with Oracle VM on Blade servers and iSCSI storage”. 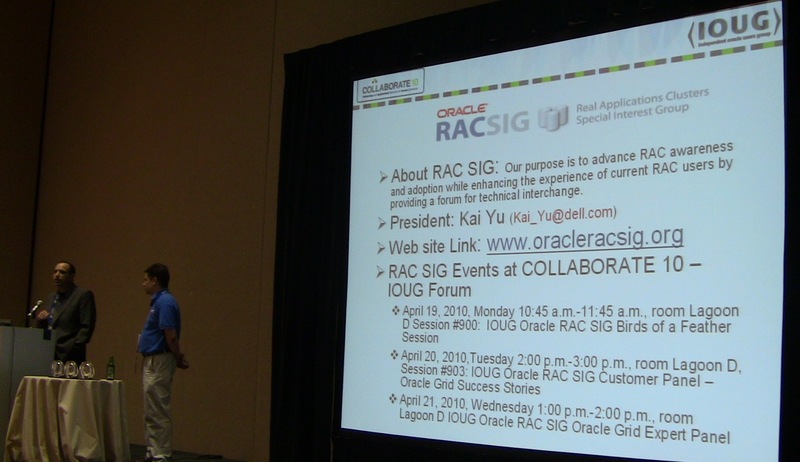 At the RAC SIG birds of feather panel, we had a good discussion on Oracle 11g R2 upgrade and RAC best practices and my Oracle presentation was very well received. My second day schddule was very full: starting the RAC performance tuning bootcamp at 8:00 am; my conference presentation “RAC Performance Monitoring and Enterprise Manager“at 11:45am, and Oracle RAC Customer Panel at 10:30am and the Performance Tuning RAC Environments Boot Camp: Expert Panel at 4:30pm. Thank Arup Nanda who not only covered his own session, also covered Riyaj Shamsudeen’s session, who was stuck in Denmark due to the Icelandic volcanic cloud. My presentation on RAC performance tuning using Enterprise Manager was also a success where the room was almost full with 60-70 people in audiences. In the RAC SIG customer panel three customers Dell IT, Bank of America and GE healthcare shared their stories about how to use Oracle RAC and Grid to consolidate their database infrastructure. At the end of day, I hosted the RAC tuning expert panel where the six top RAC tuning experts: Arup Nanda, Mike Ault, John Kanagaraj, Syamal Bandyopadhyay, and Ian Remedios shared their expertise and skills with the a good number of audiences. My Wednesday’s schedule was a little bit relax. After I gave my third , also the last presentation “Provisioning Oracle RAC in a Virtulaized Environment, Using Oracle Enterprise Manager” at 10:30-11:30 am, then I rushed to participate “ Oracle E-Business Suite Grid Customer Advisory Board” , a special meeting invited by Steven Chan and Mark MacDonald, Oracle E-Business suite and Oracle Server Technologies | Grid Competency Center development team. In the meeting, we were given the technology briefings about Oracle E-Business new development projects. Due to this two hour long meeting, I was not able to attend the Oracle RAC SIG expert panel from 1:00pm-2:00pm, but Kamakhya Singh (KP) working with four panelists Mark Farnham, Mike Ault, Markus Michalewicz and Syamal Bandyopadhyay made another successful RAC panel discussion session. 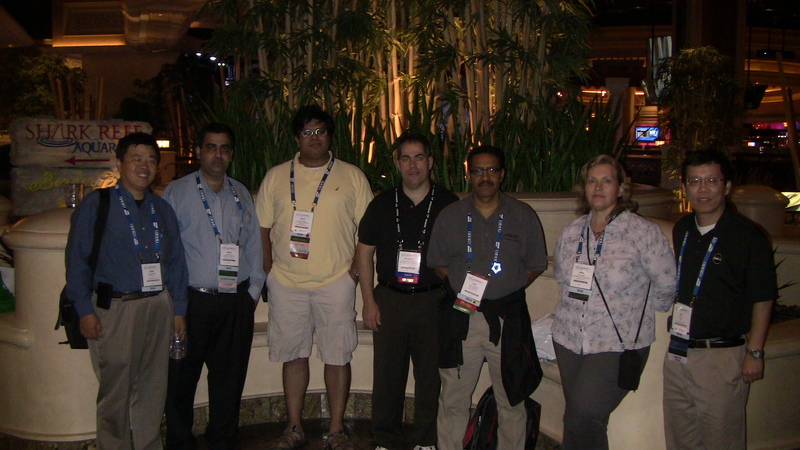 Until then I realized that all my duties on IOUG Collaborate 10 were completed successfully. What a big relief! I was so happy and eager to attend other people’s session to learn something from the conference. I was able to catch Ahmed Alomari’s presentation”Maximizing E-Business Suite Performance“. That was an amazing presentation which lasted more that 2 hrs: 4:00pm-6:10pm. I hearned a lot of new tips to tune the Oracle E-Bsuiness suite on all the layers. The Wednesday’s party started around 7:00pm. Although the dinner and the band was a kind of disappointing comparing to the Collaborate 09’s party last year or Oracle Openworld 09’s party. But it was really great to take e a break from three days’ busy schedule and meet friends and enjoyed a bottle of cool beer. 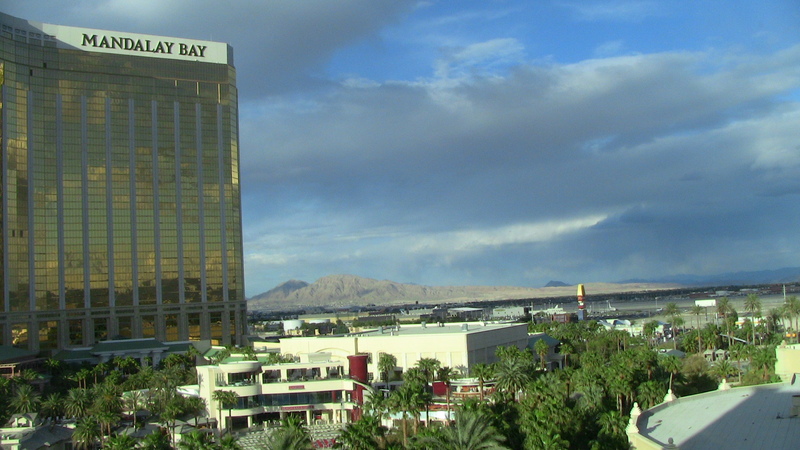 The following photo was taken through the big glass window of Mandalay Bay Convention Center at 6:30pm Wednesday April 21, 2010. The next two photos were taken during and after the party. It has been a greate conference. 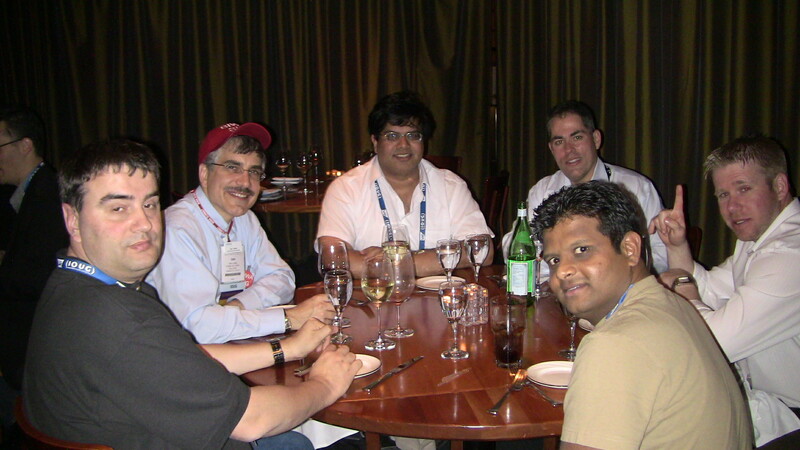 And hope to see the friends at Oracle OpenWorld 2010 as well as Collaborate 11. 1. Building Oracle Grid with Oracle VM on Blade servers and iSCSI storage, IOUG Collaborate 10 Conference, Las Vegas, April 19, 2010. 3. RAC Performance Monitoring and Diagnosis using Oracle Enterprise Manager, IOUG Collaborate 10 Conference, Las Vegas, April 20, 2010. 1. Building Oracle Grid with Oracle VM on Blade servers and iSCSI storage, IOUG Collaborate 10 Conference whitepaper, April 19, 2010. 2. Provisioning Oracle RAC in a Virtualized Environment, Using Oracle Enterprise Manager, IOUG Collaborate 10 Conference Whitepaper, April 21, 2010. 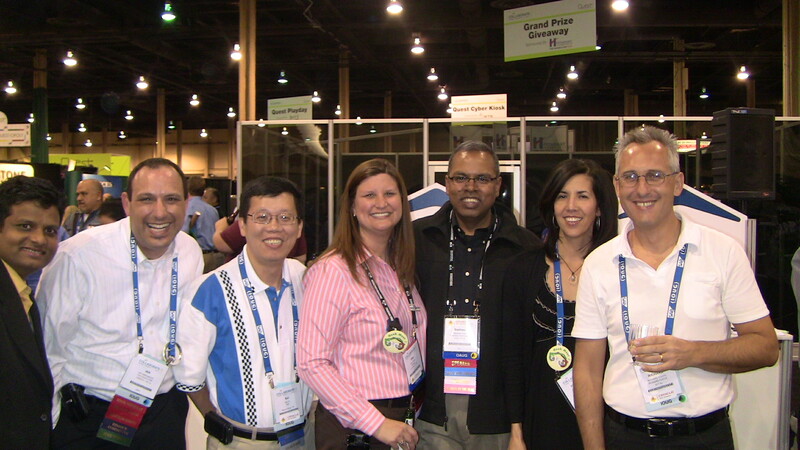 This Week I am in Las Vegas attending Collaborate 2010 conference. Today April 19 is the first day of the conference. I gave my first presentation of this conference on the storage bootcamp. The topic was building Oracle Grid with Oracle VM on blade servers and iSCSI storage. Although the session only attracted around 25-30 peoples in the audiences, the people in audiences show some good interest on the presentation as a good number of questions came up during the presentation. This session was also recorded as part of the IOUG virtual conference that was also assailable to users to watch remotely. We also had a good birds of feather session by Oracle RAC SIG . This session was a platform for RAC users to share their experience and learn each other’s experience. 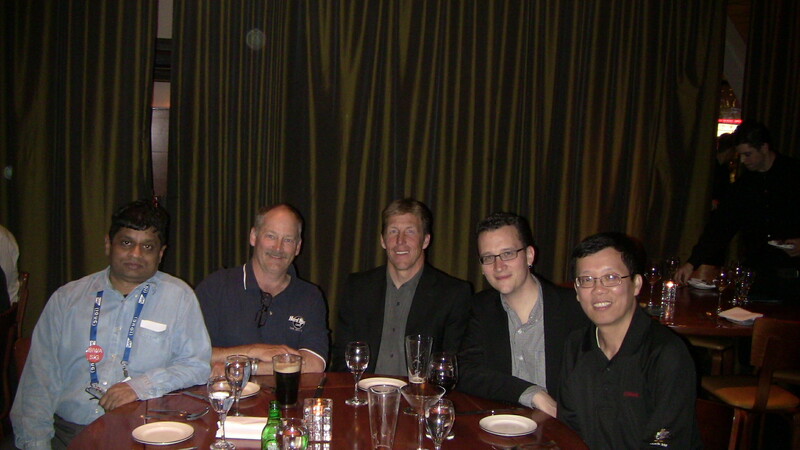 We had two major topics: Oracle 11g R2 and its upgrade process; Oracle RAC best practices. After the panel, we received very positive response about this panel. For tomorrow schedule, I will manage the IOUG RAC performance tuning bootcamp and present the quick tip session : RAC performance monitoring and diagnosis using Enterprise Manager at 11:45am to 12:15pm. and partiticpate the RAC Tunign Expert panel on 4:30pm-5:30pm. During the conference, several Oracle RAC experts and presenters are stuck in Europe due to the Iceland volcano. This potentially caused some trouble s to the conference presentation: some sessions have to be canceled. Fortunately Arup is able to pick Rijaj’s presentation ppt to present it for Rijaj in Tuesday morning. Alex Gorbachev is also stuck in Europe and will not able to attend the RAC SIG session, We are very fortunately to have Mike Ault and Syamal Bandyonpadhyay to be on the RAC SIG Expert panel. Recently it is my great honor to be nominated and accepted by Oracle ACE program and become one of 51 (as today, April 10th, 2010) Oracle ACE Directors around the world, a group of officially recognized experts with strong credentials as Oracle community enthusiasts and advocates. Work closely with Oracle product engineering teams on Oracle products such as Oracle RAC database, Oracle E-Business suite, Oracle VM and Oracle Enterprise Manager. Attend and/or present at Oracle podcast and Oracle technology event(s) such as Oracle OpenWorld and Collaborate. 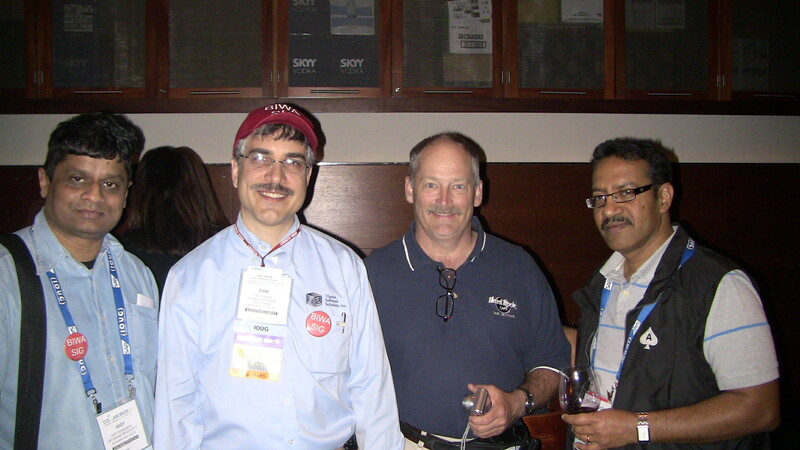 Involve and support Oracle technology commuinities such as IOUG and Oracle RAC SIG.